No Trojans will play in the 2015 NBA Finals, but a former USC basketball player could still earn a championship ring. Mike Gerrity is currently the Assistant Video Coordinator for the Cleveland Cavaliers. He has an important job as the coaches and players pour over film of the Golden State Warriors. 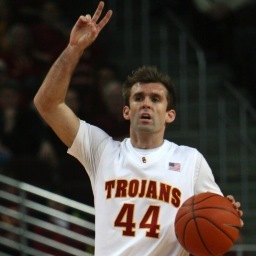 The former point guard had a brief but memorable stint at USC. In his first game after transferring from Charlotte, Gerrity helped the Trojans upset No. 9 Tennessee. He went on to earn MVP honors at the Diamond Head Classic and, despite being eligible for only one semester, was named the co-MVP of the 2009-2010 Trojans. Another former USC basketball player has ties to the Cavs. David Blu won the 2014 Euroleague Championship with Maccabi Tel Aviv and coach David Blatt, who is now the Cavs’ head coach. Blatt begged Blu not to retire, but Blu still ended up hanging up his shoes.